Overview - Four years after taking a bullet in the head at her own wedding, The Bride (Uma Thurman) emerges from a coma and decides it's time for payback... with a vengeance! Having been gunned down by her former boss (David Carradine) and his deadly squad of international assassins, it's a kill-or-be-killed fight she didn't start... but is determined to finish. Perhaps more than any of his other films, 'Kill Bill' remains the clearest and arguably most successful example of Quentin Tarantino's cinema of pastiche. Ever since he burst onto the film scene with 'Reservoir Dogs' back in 1992, the director has been alternately praised for his clever dialogue, pop culture homages and non-linear storytelling, or reviled for glorifying violence, recycling (or "ripping off") past movies and celebrating all that is shallow and superficial in the art of motion pictures. Even as he was rewarded by the box office and critics for 'Pulp Fiction' in 1994, my film school professors at the time lectured endlessly about the cultural bankruptcy of his alleged style-over-substance approach to filmmaking. It became very fashionable among my film snob friends to complain about Tarantino's hip posturing and affected air of "coolness," as well as the artificiality of his character dialogue and convoluted plots. Meanwhile, they treated Kevin Smith like a god for doing much the same, and I've never been able to understand that. At least in a Tarantino movie something happens. Originally planned as a single movie, the script for 'Kill Bill' soon grew so epic and unwieldy that it had to be split into two separate pictures. 'Vol. 1' is the more action-packed of the pairing and the one that sets the plot in motion. Uma Thurman stars as a mysterious character initially known only as The Bride who awakens from a four-year coma determined to hunt down and exact revenge on the five people responsible for putting her in that state. It turns out that The Bride was once part of a secret organization called the Deadly Viper Assassination Squad and is more than proficient with kung-fu, firearms and "the exquisite art of the samurai sword." For the crime of attempting to leave the DiVAS, get married and start a new life, her four colleagues and the mentor/father figure/lover in charge of the team (the Bill of the title) wiped out her wedding party and put a bullet in The Bride's head. That's the sort of thing that leads a person to hold a grudge. In this first installment, our heroine makes her bloody To-Do list and tracks down her first two targets: Vernita Green (Vivica A. Fox), master of edged weapons; and O-Ren Ishii (Lucy Liu), current head of the Japanese criminal underworld. 'Kill Bill' is a crazy collision of all the film and TV influences swirling through Quentin Tarantino's head: samurai and kung-fu movies, Spaghetti Westerns, the works of Alfred Hitchcock and Brian De Palma, 'Death Wish', 'Charlie's Angels', 'Lady Snowblood', 'The Green Hornet' and countless more. The picture opens with a Shaw Bros. logo followed by a quote from 'Star Trek II'. The Bride wears Bruce Lee's yellow track-suit from 'Game of Death'. An anime flashback is played to an operatic score in the Ennio Morricone mold. Sonny Chiba makes an appearance as the descendant of a character he played in a 1980 Japanese TV series. More than just a collection of disparate movie and TV references, 'Kill Bill' fully coheres into a distinct artwork with richly drawn characters, a tightly structured plot and an elaborate mythology all its own. Thurman is amazing in the lead role. She's by turns cold, strong, vulnerable, heartless, heartbreaking and above all human. The actress is put through an emotional wringer and was unjustly passed over for an Oscar nomination that year. The film has outstanding action sequences choreographed by Chiba and Yuen Wo-Ping. Its cartoonish violence (every wound issues a geyser of ruby red blood) forms a heightened fantasy accentuated by numerous surreal touches. A commercial airline has sword-holders at every seat, and a view of the Tokyo cityscape is an obvious miniature from the 'Godzilla' series. The mix of vibrant colors and striking black & white in the visual design is propelled by the director's impeccable taste in music to create a kinetic montage of dynamically stylized movement and sound. The movie is also loaded with Tarantino's trademark overly-talky dialogue, during which the characters wring profound substance and meaning from sources as trivial as a cereal commercial catch phrase. As an unabashed junkie of genre and B-movies, Tarantino recognizes that films of that sort often contain a great idea or a few great scenes, but altogether usually aren't very good. Those elements that do work are so good that they stick with viewers, and bring fans back to the movies again and again, remembering them as better than they really were. It's very rare to find a cult movie that is thoroughly good from beginning to end in every area – story, direction, writing, acting, production values, etc. In his own films, Tarantino strives to assemble that one great movie from all the elements he's picked up elsewhere whose original artists just couldn't make them work as a whole. To that end, 'Kill Bill' may be his magnum opus. 'Kill Bill Vol. 1' comes to Blu-ray from Miramax Home Entertainment (a division of Buena Vista Home Entertainment), released simultaneously with 'Kill Bill Vol. 2'. Unlike most Buena Vista releases, the disc has no obnoxious promos or trailers before the main menu. The switch to black & white during the House of Blue Leaves scene is commonly assumed to be a demand of the MPAA to secure an R rating. In fact, that sequence was actually designed as an homage to '70s kung-fu movies such as 'Heroes Two', which aired on American TV with similar transitions to tone down the violence of their action scenes*. That's exactly the sort of obscure genre reference that Tarantino thrives on. He plays against the toning-down effect by making the scene as ridiculously over-the-top violent as he can, such that even in black & white it could never get past a TV censor. The conflict between these two opposing forces gives the scene its dynamic tension. The international edition of the movie with the color fight scene is not an "uncensored" version, per se. It's a cut of the film that Tarantino prepared specifically for the Japanese market. Instead of the "Old Klingon Proverb" at the beginning, it opens with a dedication to 'Battle Royale' director Kinji Fukasaku. Since Japanese TV censors never altered those old kung-fu movies to black & white, the Japanese audience wouldn't get the joke. As such, Tarantino decided to present the scene in garish colors, which instead functions as an homage to the B-movie work of Japanese directors like Seijun Suzuki. Both versions of the film were authorized by the director and both are equally valid. They each have their own artistic merits. *My thanks to the fine folks at Video Watchdog for the example. 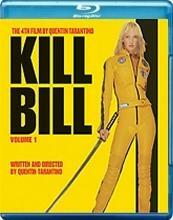 Both volumes of 'Kill Bill' were released on DVD during the period when Buena Vista thought it was a great idea to smother all of its video transfers with heavy Noise Reduction and Edge Enhancement. As a result, both standard-def discs look terrible on a large screen. The studio has generally done a better job with Blu-ray, but the recent release of 'Gangs of New York', which was sourced from a dated and inadequate master, had me worried for this title as well. Fortunately, my fears were allayed almost immediately. 'Kill Bill' looks terrific in high definition. The 1080p/AVC MPEG-4 transfer for 'Vol. 1' is presented in the movie's theatrical aspect ratio of 2.40:1. The photography by Robert Richardson swings wildly between some sequences in black & white and the rest in super-saturated color. The vibrant yellows of The Bride's track suit and truck pop right off the screen. The picture is quite sharp, sometimes extremely so, with excellent detail. You can clearly make out the wires holding up the Air-O jet and see every freckle on O-Ren's face. In one or two isolated spots, I noticed a little bit of streakiness in facial features that may be the result of DNR or a compression fault, but this was not a consistent problem. Film grain is properly resolved without looking sparkly. Much to my relief, I saw no edge ringing artifacts at all. This disc is a quantum leap improvement over the DVD. Richardson favors extremely contrasty imagery with gleaming whites and inky blacks. Bright parts of the frame sometimes bloom (like the sink in Vernita Green's kitchen), but that's a stylistic decision. The disc will be a challenge to the contrast ratios of most digital displays. Shadow detail is buried deep in the blacks, and is sometimes distractingly crushed. Dark clothing like Sophie Fatale's dress and the suits worn by the Crazy 88 often look like indistinct masses with little to no definition of texture in the black. Even so, all things considered, the disc looks great. Even better than the picture quality is the fantastic soundtrack, which is offered in standard Dolby Digital 5.1 or uncompressed PCM 5.1 formats. The PCM track in particular is a knockout. The sound mix has rich music, walloping bass and amazingly sharp sound effects. Punches, kicks, gun shots and clanging swords are all reproduced with vivid immediacy. The squishy gore sounds will make you squirm in your seat. In the midst of all this, dialogue is always clear and discernable. Whenever The Bride's real name is mentioned, the sound is bleeped out. That's a deliberate joke. I know that I shouldn't have to explain that, but I remember the waves of complaints about "censorship" when the DVD edition was originally released. I mention it here for the record. Some of the source music is a little thin and shrill, but that's part of the charm of the soundtrack and not a flaw. Unlike some more aggressive sound mixes, the surround channels are not consistently engaged throughout all of 'Vol. 1', but when they're employed (like the House of Blue Leaves battle), they're put to very creative and effective use. This is a great audio track. The majority of dialogue in the movie is spoken in English, with a select few passages in Japanese. The disc defaults to displaying English subtitles at those times. The subtitles are almost all contained within the active movie image (not the lower letterbox bar) and are safe to view on a 2.35:1 Constant Height projection screen. For some reason, two lines extend into the letterbox bar. Fortunately, neither is an important piece of dialogue. The Blu-ray carries over all of the bonus features from the DVD edition. Unfortunately, the DVD was pretty sparse in that regard. The Making of Kill Bill (SD, 22 min.) – This fairly decent, if rather promotional, EPK piece features interviews with Tarantino and the cast. They talk about the origins of the project, the characters, casting, film influences, music and shooting in China. The 5, 6, 7, 8's Musical Performances (SD, 6 min.) – Unused footage of the all-girl Japanese surf band performing two songs on set. Sadly, the sound quality of this clip is extremely poor. Tarantino Trailers (SD, 12 min.) – A collection of trailers for Tarantino's films, not all of which are distributed by Buena Vista: 'Reservoir Dogs', 'Pulp Fiction', 'Jackie Brown', 'Kill Bill Vol. 1' teaser, 'Kill Bill Vol. 1 "bootleg" trailer and the 'Kill Bill Vol. 2' teaser. I'm sure that a number of people will decide to pass over this Blu-ray release of 'Kill Bill Vol. 1' while they wait for either the Japanese theatrical cut or 'The Whole Bloody Affair'. Good luck to you. I certainly don't have that much patience. My only disappointment with the 'Vol. 1' Blu-ray is the anemic supplement package, but the old DVD was no better in that regard. Otherwise, the disc has terrific video and audio quality. I recommend it highly.